Rarely does the sun and the moon align just right that 2 of my quilts are featured in different magazines the same month. So February 2014 must be lucky for me. see my Lone Star Sampler quilt. 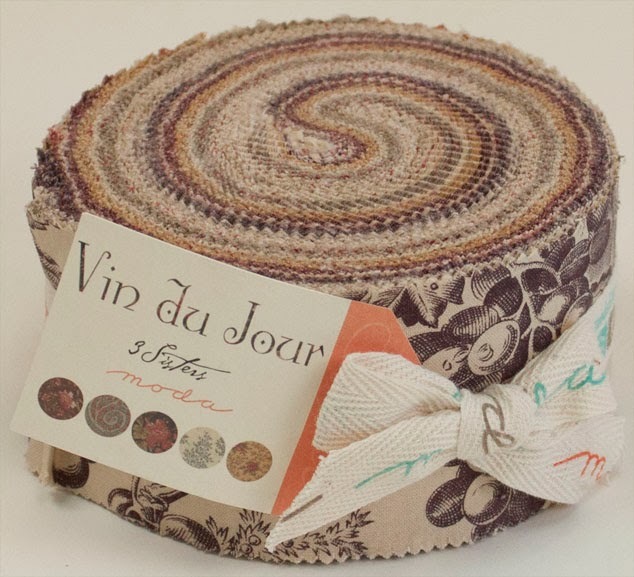 I set forth to see what I could do with a Jelly roll. This collection has the perfect balance of lights and darks. Almost exactly half darks and half mediums/lights making the combinations of values endless. light and darks to determine the the pattern. Strip piecing the sections and reversing some of the strips makes this quilt look more difficult that it really is. Which is your favorite star block? possibly block 1, row 3.
had to use it for some of the backgrounds. To read more about this issue, click here. I hope you enjoy this quilt as much as I did making it. Love this. I had downloaded pattern yesterday but since purple is my favorite your examples are gorgeous. I would choose Row 2 Block 2 or Row 3 Block 3 as favorites because of the background. Lovely work! 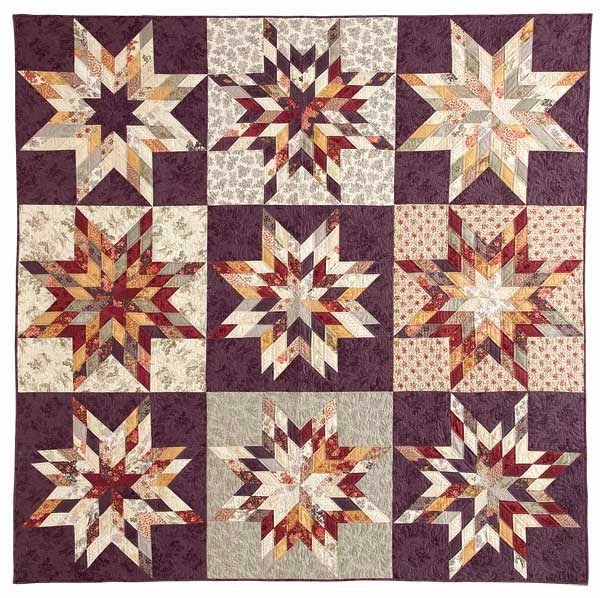 I'm not a big fan of purple but I love lonestar quilts, this is beautiful! Row 2 block 3 is my fave. I've been quilting up my own lonestar the last couple of days. One that I designed with a christmas theme, cardinals and holly applique. Simply gorgeous! My favorite is row 1, block 3. I really like row 2 block 3. I love this line of fabric too! What a fun block to play around with, it has always been one of my favorites and with snow in the forecast, just maybe I will have some playtime coming my way! Just noticed you in both magazines this morning. Congrats. Both quilts are lovely – hard to decide which one to start first! Enjoyed your comments about the fabric selection for the lone star quilt. I can see how that purple could grow on you. Love these colors and the lonestar blocks are fabulous, but beyond my skill. Congrats on the two magazines and love the quilt. Hi! Just became a follower of your blog. Please come follow us back. Thanks! I love this quilt!! As soon as I received my copy of the magazine I spent at least an hour staring at this quilt, reading the construction method, and just thinking about making it myself. I have a definite favorite – row 2, block 1. Even if I never make the whole quilt, I will be trying to duplicate that block! Great job! Dang, now I wish I had picked up this fabric when everyone was having their Black Friday sales – this is stunning! My favorite is block 1, row 2. I just picked up this magazine – I always buy it but I don't have a subscription. You're a cover girl again. I love purple – quilts and clothes – so this quilt has my name on it for sure. Can't wait to start it!